Slide-A-Note music classroom posters assist music teachers teaching how to read music for violin, viola, cello and bass. 28 x 22 inch high quality educational posters are perfect for class string instruction. The string instrument classroom posters come in four versions: violin fingerboard charts, viola fingerboard charts, cello fingerboard charts and bass fingerboard charts. These are not the typical fingerboard posters! 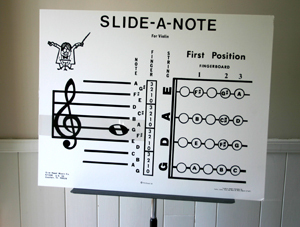 The Slide-A-Note classroom posters are unique in that they allow the student to easily see the correlation between the instrument fingerboard and the musical staff. A plastic acetate slide displays a moveable note. When you move this note to different points on the staff, you can immediately see its relationship with the finger position of the instrument. (Each string Slide-A-Note displays first position only.) Also, the name of the note is spelled out and the finger number for that note is indicated. 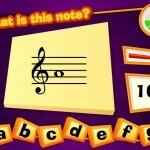 The Slide-A-Note is one of the best music classroom resources for music teacher supplies that you will ever use! All string teachers find these music posters and classroom charts to help with the teaching process of reading music. Music teaching supplies would not be complete without these violin posters, viola posters, cello posters and bass posters. The carrying case, in a tent like position on a table, allows you to instruct from this position, or the chart can be placed on a music stand. Slide-A-Note Perfect For Teaching Beginning Strings! Instantly see correlation between staff and fingerboard! Helps you check if your are reading correctly! Learn staff lines and spaces along with ledger lines and spaces! Helps you learn how to read notes! Helps you learn how to read music! Violin charts, viola charts, cello charts, bass charts. If the plastic slide appears loose, here is what to do: When slide is first placed on the chart, run it up and down several times. This will induce static which will help. If it still appears loose then press in slightly along the crimped edge. That will keep it in place. An innovative step-by-step sight reading program for musical keyboard players of all levels, from Sound Feelings. The Super Sight Reading Secrets book has provided the answers to sight reading problems for thousands of pianists and keyboardists! This book is available directly from the publisher. Also, please see our links to other great sites about sight-reading, music theory and performing arts medicine.